You can use surveys to receive feedback from your students or give them some extra points by responding to a survey. Graded surveys appear in the Syllabus, Gradebook, Calendar, and To Do Lists. Student Analysis for surveys must be downloaded as a CSV file. Item Analysis is not available for surveys. 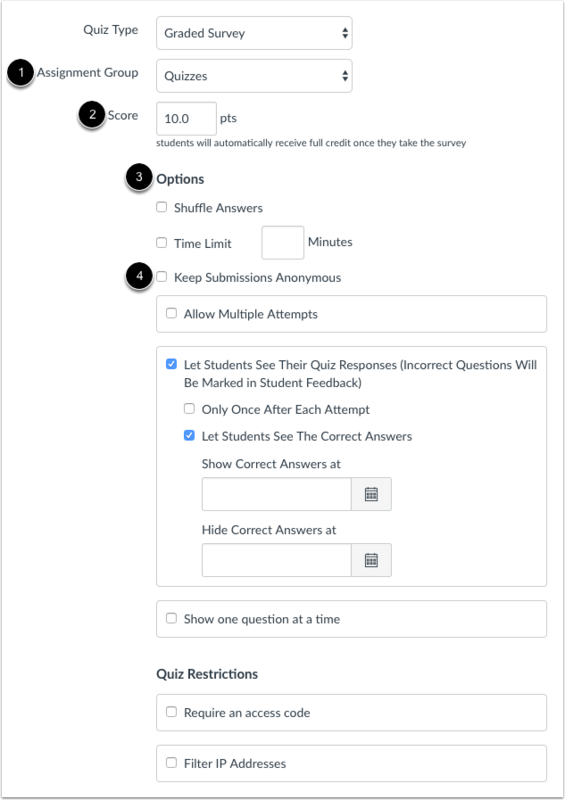 The anonymous option can be enabled or disabled before or after a survey has received submissions, allowing a user with sufficient permissions to see a student's identity and responses. To collect fully anonymous survey responses, you may want to use a third-party survey tool. 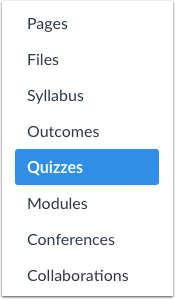 Click the Quiz Type drop-down menu. 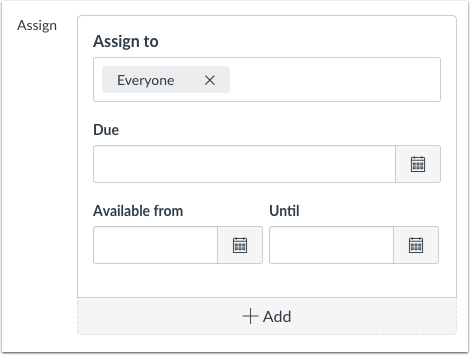 Give your survey a name , and complete any survey instructions in the text box . 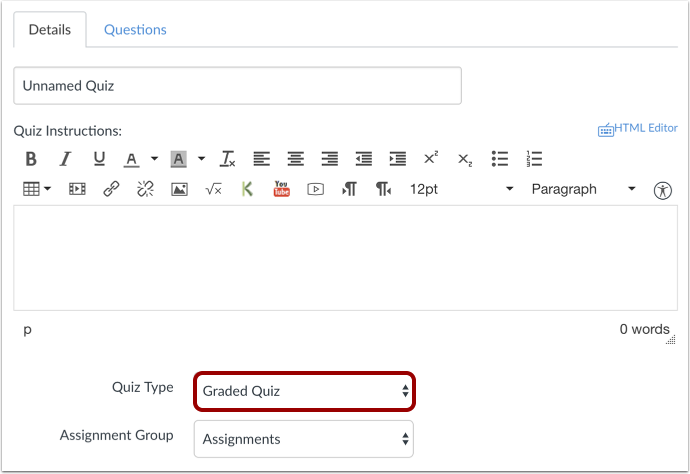 In the Quiz Type menu, select the survey type you want to create. Place your survey in an assignment group , assign your survey a score , and complete the survey options . Within surveys, you have all the regular quiz options, but you can also keep submissions anonymous . This anonymous option applies to both graded and ungraded surveys and can be enabled and disabled before or after survey submissions. You can also set a due date and available from/until dates for your survey. Click the Questions tab . Manually create a new survey question by clicking the New Question button . To find out what kind of options are available for questions, please see the question type lesson in the Instructor guide. Note: If you include a file upload question on an anonymous survey, the downloaded files will include the student's name in the file name. To preserve anonymity on a survey, do not include file upload questions. Survey questions are not automatically numbered for instructors. 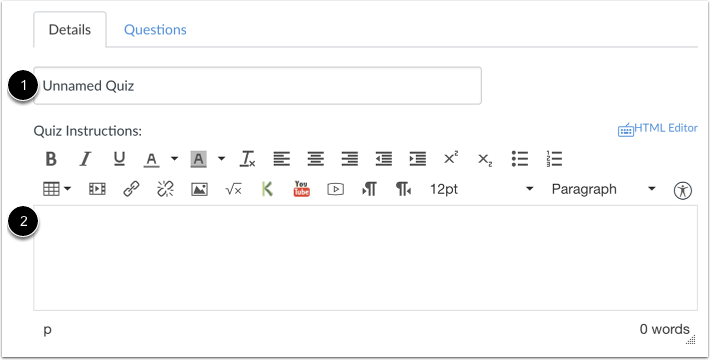 To add a custom name to your survey question, enter the name in the question text field. Custom names can help you identify survey questions more easily. Regardless of the question name, students always see survey questions in numerical order (i.e. Question 1, Question 2). If you're interested in creating questions that involve a quantitative scale, you can create a Likert scale question using the Multiple Dropdowns question type. Please reference the Likert scale lesson for more information. Click the Save button to save your work and preview the survey. Note: You should not publish your survey until it is your final product. If you are ready to publish your survey and make it available to students, click the Save & Publish button. To preview the survey, click the Preview button . When you are ready for students to see the survey in the course, click the Publish button . Previous Topic:How do I regrade a Multiple Answers quiz question? Next Topic:How do I view survey results in a course? Table of Contents > Quizzes > How do I create a survey in my course?